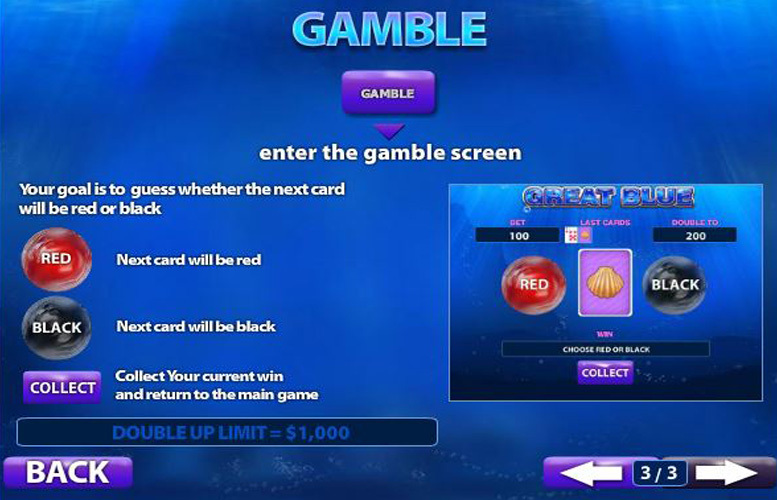 Taking players down to the depths of the open ocean, Great Blue is a nautically themed five reel, three row and 25 payline slot game with a theoretical return to player percentage of 96.03% and a whole host of sea creatures on its reels. 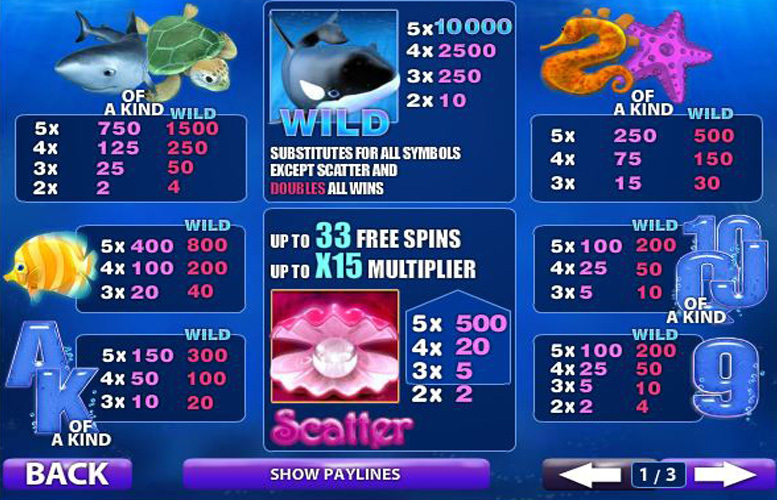 That under the sea theme is continued, too, in the slot’s additional features which include an orca wild symbol and a pearl oyster scatter which triggers both instant prizes and potentially very rewarding free spins. The Great Blue theoretical return to player percentage of 96.03% is more impressive than those found with a lot of similar slots. The game’s scatter symbol can deliver impressive instant prizes, as well as up to 33 free spins with an up to 15x multiplier. Wild substitutions help to boost players’ chances of achieving valuable combinations, and any winning combination including a wild sees its winnings doubled. Looking purely at the main game, Great Blue’s top payline jackpot is just £20,000 which is lower than the highest payouts offered by many other games. The range of wagering options offered to players is comparatively limited, with bets having to fall between 1p and £50 per spin. Great Blue may be set beneath the ocean waves but there’s nothing fishy about how players can achieve the highest payouts. They need simply see five matching symbols line up consecutively from left to right along one of the slot’s active paylines. The most valuable five symbol combination of all is one comprised entirely of the Great Blue wild symbol, which depicts an image of an orca. Five of those along an active payline results in a jackpot worth 10,000 times the chosen line bet, which at the maximum line bet of £2 will be worth a cool £20,000. 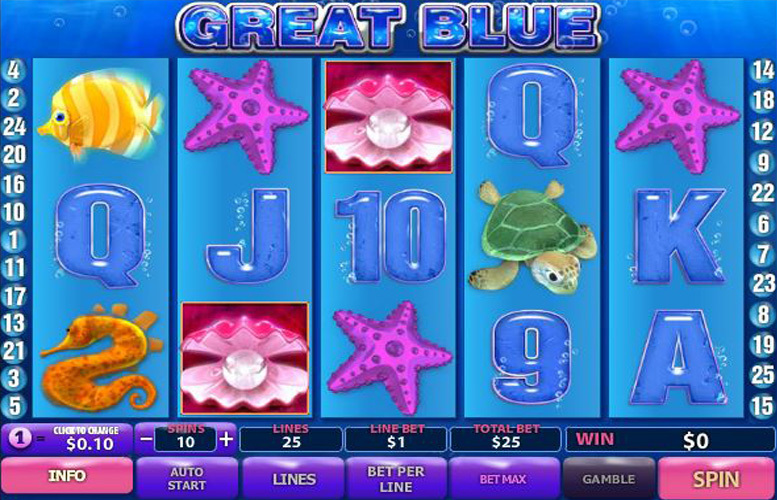 Whilst not one of the more complex slot games around, Great Blue does include a couple of additional features to add extra interest to gameplay and to boost winning potential. Those are the slot’s wild symbols and its scatter symbols which offer instant prizes and trigger free spins to boot. Just like a joker in a card game, the Great Blue orca wild symbol can stand for any other symbols – aside from the scatter – when it appears on the reels. What’s more, when the symbol does take the place of another to form a winning payline combination, the winnings from that combination are automatically doubled. The scatter symbol on the Great Blue reels shows off an image of an oyster shell with a sparkling pearl inside. When two or more of these appear anywhere, instant wins are triggered which are added to any traditional payline wins from the spin. Three or more of the scatters appearing at once, meanwhile, also triggers what is known as the slot’s Sea Shells Bonus. 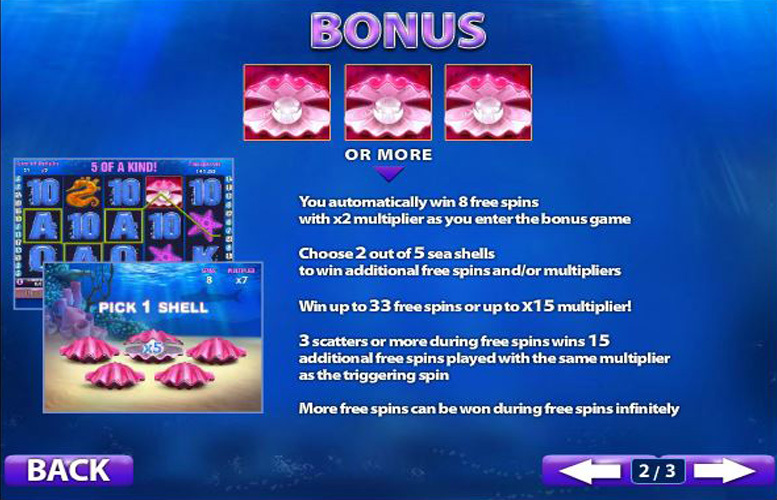 Eight free spins with a starting multiplier of 2x are automatically triggered and players can then pick two shells from a choice of five to be in with a chance of increasing the number of spins to as much as 33 and the multiplier to as high as 15x. Sticking closely to the slot’s overall theme, Great Blue’s regular symbols depict either images of sea creatures or of letters of the alphabet which have sunk beneath the waves. It is five symbol combinations of the former which are the most valuable when it comes to the size of their payouts. After a combination of five of the game’s wilds, the next best combinations are those comprising five shark symbols or five sea turtle symbols. Each of those combinations return jackpots worth 750 times the chosen line bet. If a Great Blue player wishes to change their stake amount for a spin, they can change the number of active paylines for the spin, their wager per active payline or both. All in all, the overall range of available bets stretches from a minimum of 1p to a maximum of £50. The minimum bet is achieved by selecting just one active payline and by setting the line bet at 1p. The maximum wager, meanwhile, is available by activating all 25 paylines and choosing a line bet of £2. There are, of course, also a number of other staking alternatives between those two extremes. Giving players the chance to explore the depths of the ocean without so much as getting their feet wet, Great Blue is a slot game with many things to admire about it and just a couple of slight weaknesses. On the positive side, the game’s extra features add a good degree of extra interest to gameplay and enhance the slot’s winning potential no end. Those features, after all, include wilds that also double payline jackpots and scatters which both provide instant wins and can trigger up to 33 free spins with an up to 15x multiplier. Away from those enhancements and added extras, though, this slot’s payline jackpots are actually on the low side when compared to other similar games. What’s more, the range of available wagering amounts per spin is also a little restrictive.